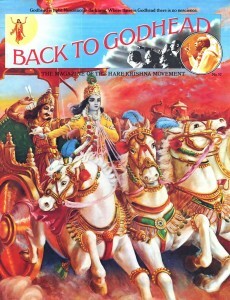 Back To Godhead Vol 57, 1973. What thoughts cross your mind when you are asked what you think or know about a Hare Krishna devotee? What is his background? Why is he a devotee? What are his cherished goals? How does he live his private life? What is a typical day for a devotee? Most people do not know the answers to these questions. In order to clear up these questions for a large number of people, we would like to present a typical devotee. The devotee we have chosen is Kavicandra. (This is his spiritual name, which was given at the time of his formal acceptance as a devotee.) Kavicandra is a soft-spoken, twenty-six-year-old family man with a three-year-old daughter with blonde curly hair and blue eyes. He was born in Minneapolis and attended the University of Minnesota, where he was a liberal arts student. It was at this time that he met his wife, a pleasant brunette with a background of Christian training who is now called Mahasini. In 1971, discouraged with the materialistic standards of modern society, they began seeking a life of seclusion. 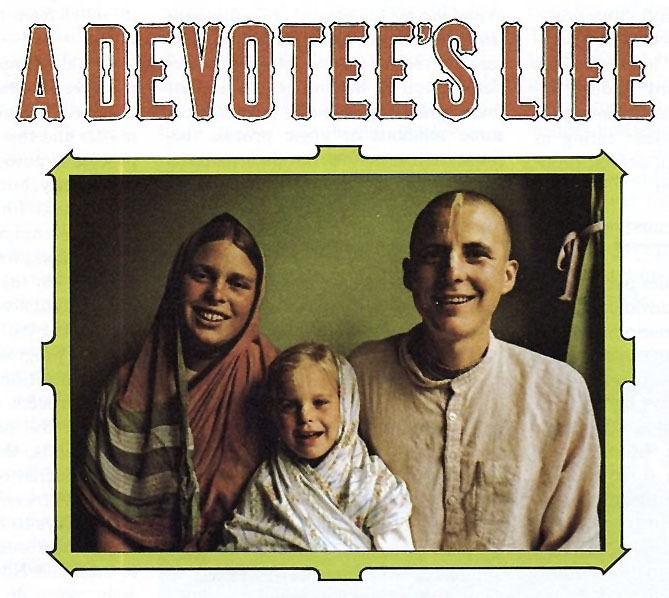 In the midst of their search for a pure life (especially for their young daughter), they happened upon the Hare Krishna devotees in Tucson, Arizona. When he first saw them, Kavicandra was immediately struck by the devotees’ great happiness. From this point he was naturally intrigued to know more about the Hare Krishna movement, and gradually he began associating with the devotees more and more. Kavicandra recalls, “The devotees were honest and happy. They were actively doing something, and it was pure. Truthfulness—that was the main thing. It was fresh. Everywhere else, everyone was uptight, cheating and lying to one another. The devotees were just trying to serve Krishna [God] together.” Gradually, over a period of months, Kavicandra and his family became progressively attracted to devotional life, and step by step they became full-time devotees. 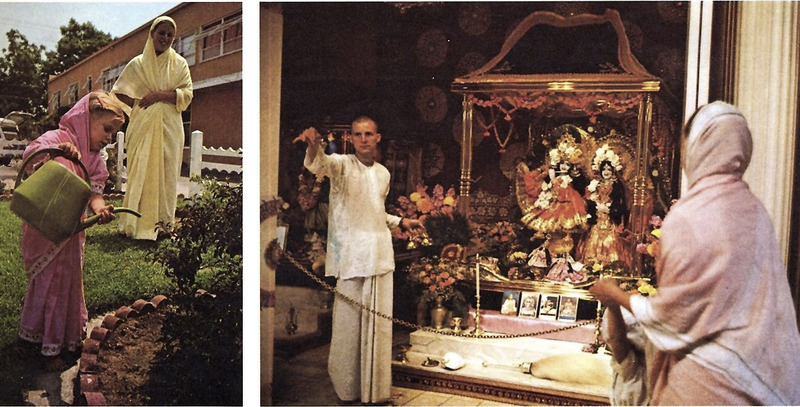 The Tucson Hare Krishna center was too small to meet the needs of their entire family, so Kavicandra moved to a larger center in Dallas, Texas, which is the home of the Hare Krishna movement’s Gurukula, or children’s school. In Dallas he was a sales representative for Spiritual Sky Scented Products, a devotee-owned business with headquarters in Los Angeles. In the spring of 1972, when there was a need for a production foreman at Spiritual Sky, Kavicandra moved to Los Angeles to fill the post. Since then, Kavicandra has experienced increasing fulfillment in his daily life, which is one of dedication to the ideal of serving the Supreme Lord wholeheartedly. 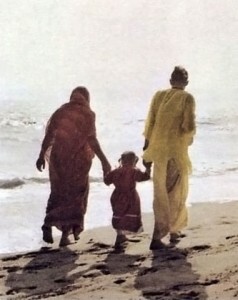 On a typical day, Kavicandra rises so early that it is practically a symptom of devotion in itself: 3:30 to 4:00 a.m. After a shower and a brief period of chanting the Lord’s names on his japa meditation beads, he walks the short distance from his apartment to the temple with his wife and daughter. At 4:30 there is an aratrika ceremony, an active affair for hundreds of devotees who join in the ecstatic dancing and responsive singing of prayers, accompanied by the melody of a harmonium and the beat of many karatalas (hand cymbals). After this joyful ceremony, which lasts about thirty minutes, Kavicandra and most of the other devotees begin their main period of japa meditation. Japa is performed by softly chanting the Hare Krishna mantra: Hare Krishna, Hare Krishna, Krishna Krishna, Hare Hare/ Hare Rama, Hare Rama, Rama Rama, Hare Hare. You will generally see each devotee carrying a small cloth bag, about the size of a large pear, by a strap around his neck. This bag contains a string of wooden prayer beads, each the size of a small marble, which the devotees use to chant japa. After the japa period, which ends at 6:30 a.m., the devotees chant Gurvastakam, accompanied by dancing and the melodious harmonium, a mrdanga drum and hand cymbals. The Gurvastakam are verses in praise of the guru, or spiritual master, who plays a most important role. The spiritual master is God’s representative from whom the forgetful soul receives instruction and guidance in reviving pure consciousness. His Divine Grace A.C. Bhaktivedanta Swami Prabhupada is the present representative in the disciplic line of teachers. Srila Prabhupada (prabhupada is a title that honors a great spiritual master in the line of devotion) came to the United States in 1965 to teach the practice of bhakti-yoga. He is the founder of the International Society for Krishna Consciousness and the spiritual master of the members of this worldwide organization. A PURE LIFE–Left: Mahasini looks on as her daughter, Bhakti, waters tulasi plants in the Los Angeles temple garden. Tulasi is especially sacred to Lord Krishna. Right: Kavicandra performs aratrika, offering incense to the temple deities and then to the assembled devotees. At 8:30 there is breakfast for all. Kavicandra’s diet consists entirely of prasada, sanctified food first offered on the altar to the Lord. Partaking of this delicious food is one of the most easy and delightful practices to which the devotees adhere. Only pure foods are offered and then distributed for everyone. Following breakfast, Kavicandra drives to work as millions of other Americans do. As we mentioned before, Kavicandra works at Spiritual Sky Scented Products, a devotee-owned and devotee-operated business enterprise that is a major source of financial support for the Hare Krishna movement. He works as a production manager of the incense division, which is capable of producing over one million sticks of incense a day. Kavicandra has become expert in supervising production in every way, especially in formulating and mixing the various combinations of scenting and coloring materials. Some of the thirty scents of stick incense and twenty flavors of cone incense are imported from all over the world, including the Near East, Southeast Asia and India. The constant supply flow, quality control, ordering of materials, personnel supervision, and management of packaging and deliveries make Kavicandra’s days very busy.. “This may seem the same as any ordinary business,” stated Kavicandra, “but the reason we do it is different. We are not working for the frustration of gaining money and planning how to spend it. The workers are joyful because they are serving their beloved spiritual master and the Supreme Lord by their activity.” In fact, the factory is filled with the sounds of Prabhupada’s lectures and pleasing chanting coming from a tape recorder. The incense factory closes at six o’clock, when the crew of devotees drive the short distance home. SHARING AND WORKING FOR KRISHNA–Left: Kavicandra offers Back to Godhead to pleased onlookers at a Hare Krishna festival. Right: Devotees work hard in transcendental Krishna consciousness. Following a light meal and a shower, Kavicandra and his family go to the temple for the evening aratrika ceremony, which they sometimes perform themselves in the key role as pujari, the person who offers the various articles on the altar on behalf of the entire congregation. The aratrika ceremony is extremely colorful and melodious, with offerings of delicious foods, lamps of camphor and clarified butter, flowers, water and fragrant incense, all to the accompaniment of melodious responsive singing with instruments such as hand cymbals, drums and gongs. i love Kavicandra life. work to serve God all days. what a peaceful life.